Cornrows are coming back. Online they're part of the "ghetto goth" zeitgeist, and growing up we were always given cornrows to keep from messing up our hair during playtime. Forget that--these next few styles are about to break the bad rep this classic hairdo typically gets. 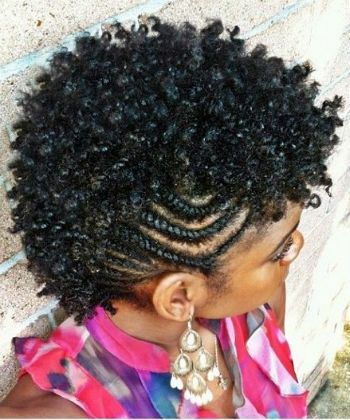 Here are 6 cornrow styles that are appropriate for both work and play. 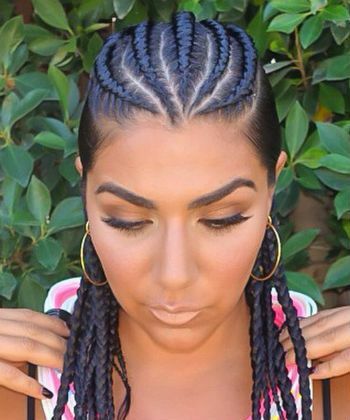 Classic cornrows are parallel from front to back. Simply start each braid at your hairline and braid to the nape of your neck. Do this until all of the hair on your head is braided. 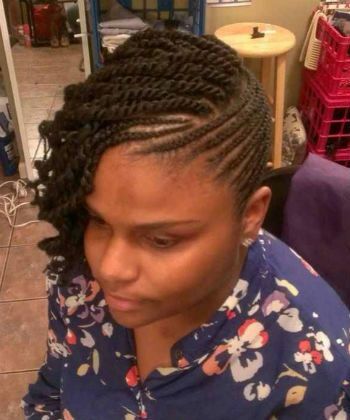 This style of cornrows is popular all the way from 4C to 2A. Versatile and trendy, this style is spunky and upbeat. 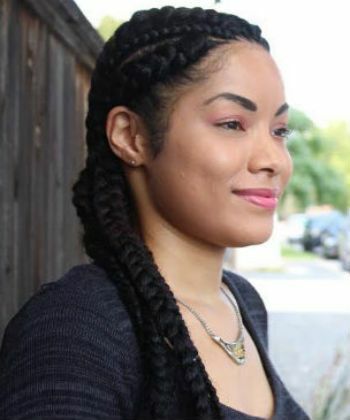 Simply cornrow one-quarter to one-half of your hair to the back of your head and pin the ends behind the rest of your hair and wear the rest of your hair down or in chunky two-strand twists. Cornrow both sides of a fresh twist-out starting at the side of the top of your head, leaving about two inches of spaces between the cornrows coming from the left as well as the ones coming from the right. Do not braid the hair in that space at all. 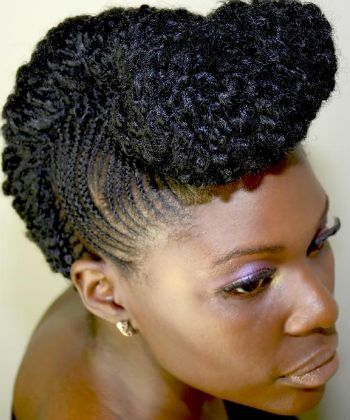 When the cornrows reach the space of unbraided hair, secure with bobby pins. Start out similarly to how you would when braiding a cornrow ponytail. Braid all hair to meet at the crown of the head. Put the remainder of the braids in a ponytail then secure with pins or go straight to securing your desired look with various types of hairpins. 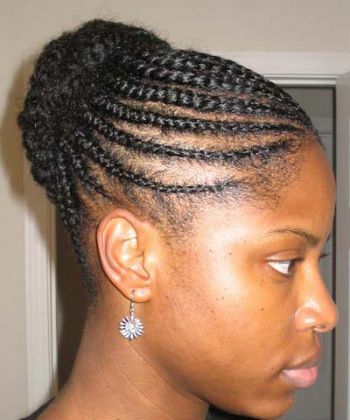 You can also braid all of the cornrows to meet in the same place, and leave the remains of the hair unbraided. Wrap a large hair tie around tight enough to secure the ends in the bun. Separate your hair on your crown into about 6 finger-width cornrows that are to the back but follow the natural curve of your head. Slick down the loose hair on both sides with an edge tamer. Wear the remainder of the braids down in individual braids over your shoulders. Use added hair (if your natural hair isn't past shoulder-length). On freshly washed hair, flat twist the sides, secure with bobby pins, and leave enough hair in the front left out to do a roll and tuck.